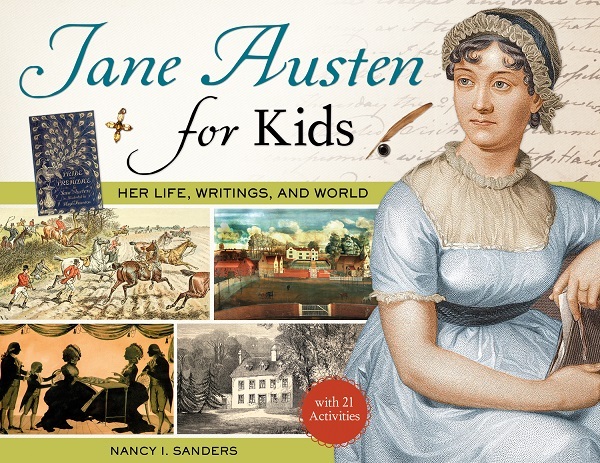 Welcome Nancy Sanders and Jane Austen for Kids! 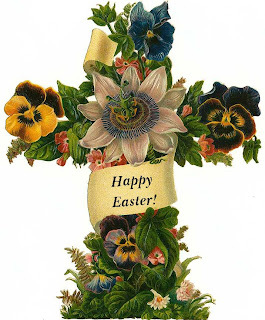 It is Good Friday, a day for somber reflection, although it’s hard to be sad when we know Easter is coming! Good Friday marked another day in Regency London. It was the day to buy hot cross buns at the Chelsea Bun House (mentioned in a post nearly 10 years ago now!). While the exterior of the single-story building was fairly standard, the interior was eclectic, with clocks and curiosities from foreign locales sprinkled about. 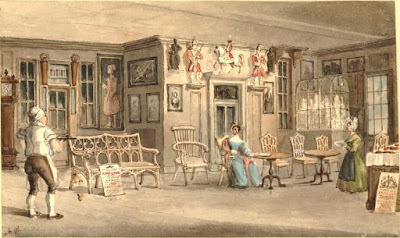 King George II, Queen Caroline, all the princesses, and George the III and Queen Charlotte were said to be customers. On Good Friday, however, people lined up for cross buns hot from the oven, with sales beginning as early as four in the morning. Numbers vary, but one estimate put the crowds at 50,000. Some years, the ravening customers were so many in number the shop had to close its doors and hand buns out through the shutters. 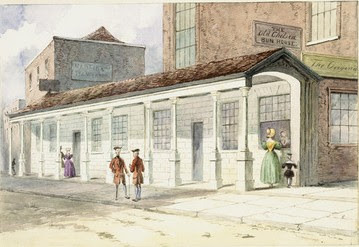 In 1839, the last year of the shop, nearly a quarter million buns were sold! Sadly, the Hand family died out, and the shop was closed and its contents auctioned. But the name Chelsea bun is still used to this day. Hungry for more information about the Chelsea Bun House? 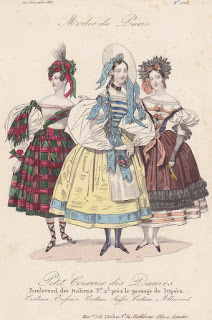 Try this great post on Jane Austen’s World blog. Whether you line up for buns or not, happy Easter! I am delighted to announce that Between Silk and Sand has been chosen as a finalist in two more contests...but for these, YOU and other readers help decide the outcome, by voting for your favorites. 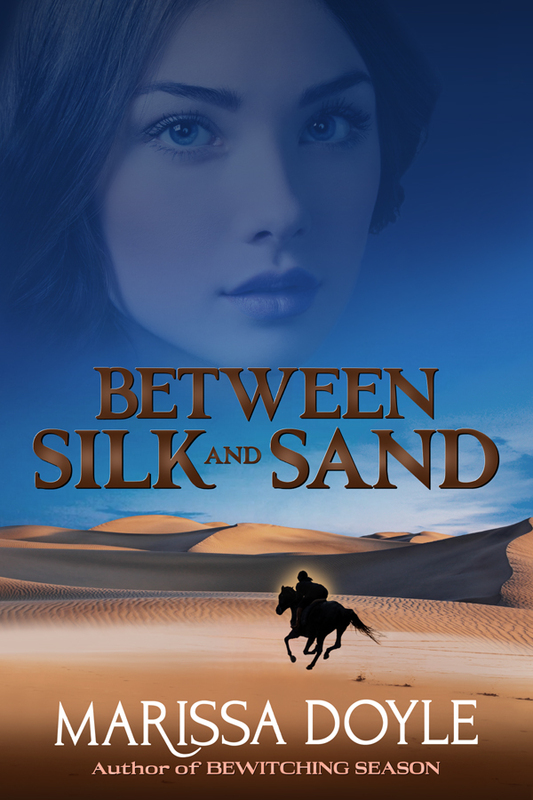 I’m especially excited that Between Silk and Sand is a finalist in InD’tale Magazine’s 2019 RONE Awards, Best Young Adult category. Finalists are those 2018 books that have received a 4.5 or higher star rating/Crowned Heart of Excellence from InD’tale Magazine; the top four books in the category will go on to be judged by industry professionals to name the winner. But to chose those final four, readers must vote! If you have a few minutes, please go to https://www.indtale.com/how-subscribe to get signed in to vote; it’s a two-step process (you’ll register, then receive a verification code to click on). Then you’ll be free to vote—this week, for the YA and Suspense/Thriller categories—but also for the other categories coming up in the next few weeks. A complete list of finalists is here—check it out! The second contest is a little closer to home for me. 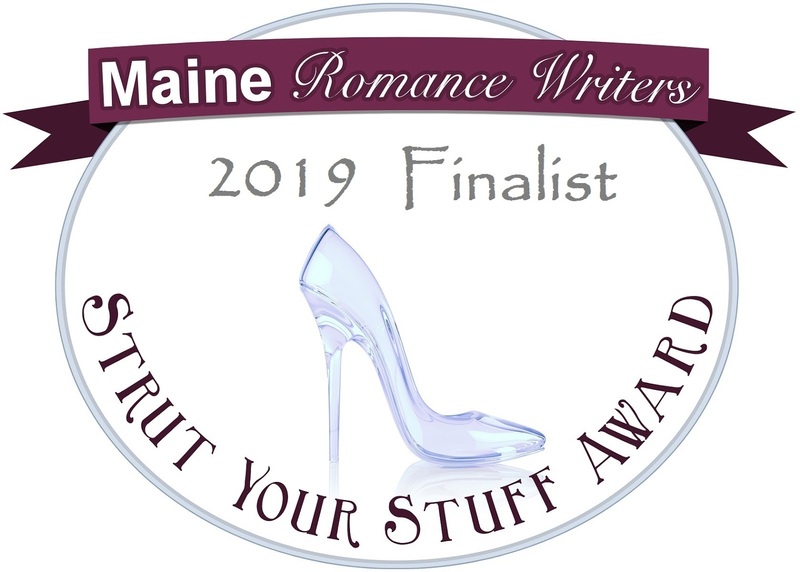 The 2019 Maine Romance Writers’ annual Strut Your Stuff Award judges the best romance novel packaging—the cover and back cover blurb—for books published in 2018. It’s a little more nuanced than most cover contests: you rate the covers and blurbs separately, on their own merits—so the winners will truly have the best “stuff” to strut! The finalist lists and links to vote are here...go have a read and a look, and rate the covers and blurbs. Publishing is a tough business, and the toughest part of it for authors isn’t the writing (nope—that’s the fun part) but the visibility part—getting the world to even know you have a book for it to read. That’s why I’ve entered Between Silk and Sand in these contests...and your votes will help me get the word out about it. 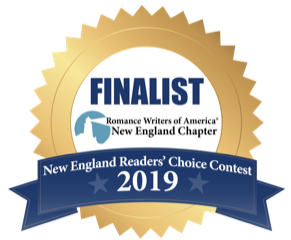 If you can take the time to vote in either of these contests, I thank you—it is most truly appreciated! Labels: Between Silk and Sand, contest, InD'tale Magazine, Maine Romance Writers, vote! My state is currently debating whether to remain in Daylight Savings Time all year long. More light in the evenings is said to prevent traffic accidents during our evening rush hour (not sure why we have fewer accidents in the morning—less tired, perhaps?). More evening light is thought to deter crime as well. Apparently, a state can stay on standard time all year without much hassle, but staying on Daylight Savings Time requires a waiver from the federal government. Hence, the debate. Regardless, changing the clocks back and forth would not seem to serve the purpose it once did. I had always been told it had a farming benefit, but my husband (wise man that he is) pointed out that farmers rise with the sun, whenever the sun rises! So I did a little digging into the concept. Daylight Savings Time was first proposed by Benjamin Franklin, half in jest, to help limit the amount of oil necessary for lamps to illuminate the evening hours. The idea took hold, however, for some in Britain, who argued in vain for some years (read decades). Germany was the first to advance the clock to allow more light in the evenings in the early 1900s. Britain followed, despite protests. For example, the Royal Observatory insisted on maintaining Greenwich Time steadily throughout the year. But the argument that stood out to me came from Lord Balfour in Parliament. What if twins were born on either side of the fall switch? As the clock turned “back,” the second child would actually be born before the first! That could upset not only who inherited the property, but who inherited the title. Horrors! 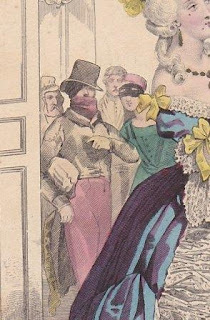 Though he worried about this around 1915, I can imagine our nineteenth century characters being just as concerned. 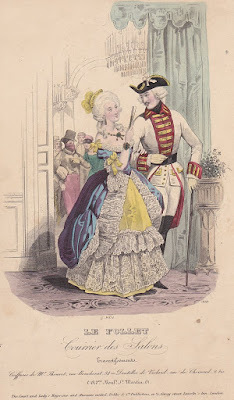 So, what if someone decided to promote Daylight Savings Time during the Regency. Can you picture the debate then? Would someone please write that book? My plate, alas, is too full! This week we have a very special interview with Nancy I. Sanders, who's written a book you'll want to hear about! Read on. Nineteen Teen: Welcome to Nineteen Teen! We were excited to hear about your new release, Jane Austen for Kids. Your book gives people of all ages insight into our beloved Jane and her times. You’ve written similar works about Frederick Douglass and African-American history. What drew you to Jane Austen and her life? Nancy: When I was 18, I read Pride and Prejudice aloud with my future sister-in-law. 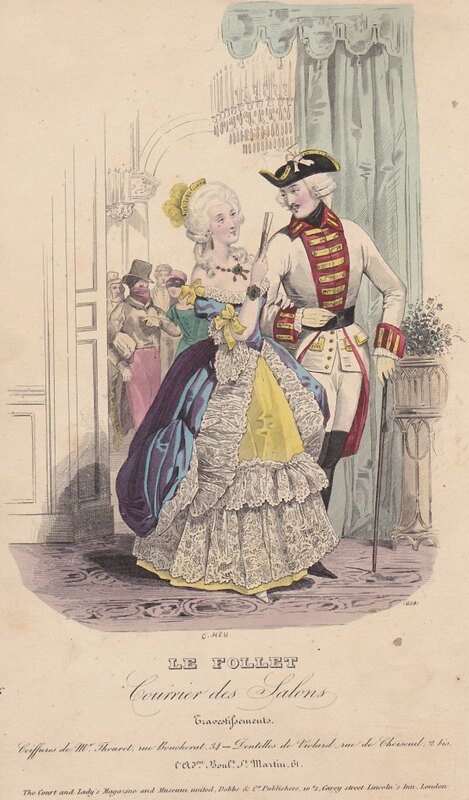 I fell in love with Jane Austen’s romantic writings on the spot…so much so that when I met my future husband, Jeff, he gave me a one-volume set of Jane Austen novels as a wedding gift. That was 37 years ago! As a children’s writer, I wanted to bring Jane’s life and times to teens and tweens so their interest with all-things-Jane would be sparked in this new generation. 19T: Where did you go to find information on her childhood? Nancy: Researching her childhood was actually quite tricky. Most biographies on Jane include a chapter or two about her childhood and the rest of the books focus on her adult life and writings. I wanted this biography to be different. I wanted to focus on her growing-up years instead. So I went to Jane’s own writings—her juvenilia—and started asking myself “Why?” Such as why did Jane write about “The Beautifull Cassandra” and make her story like she did? Then I followed numerous bunny trails and discovered that Jane had just made a trip to London at that time, perhaps even her first trip there! I started connecting the dots amongst scanty information in a huge stack of research books that was taller than I am! I scoured these books to find answers to my questions and was able to gain a better understanding of Jane’s teenage years. 19T: What surprised you the most about your research? Nancy: I was surprised to learn that Jane had quite a famous music teacher and that she was such a lover of music herself. I play the piano, so when I read that Jane started each day playing the piano, I could understand how it helped her get in the mood to write for that day. 19T: You were in England in 2017, when the country commemorated the 200th anniversary of Jane Austen’s death. What was your favorite site to visit and what did you learn there? Nancy: I have so many favorite sites that we visited. There were the homes of Jane…the huge mansions…the movie sites…the small corners that Jane delighted in. One of my favorite sites to see was the ancient yew tree that stands in front of St. Nicholas in Steventon, the church Jane attended growing up where her father was rector. I stood under that tree and realized this tree was so old that Jane probably stood under it, too! I was expecting to see centuries-old buildings on our tour, but hadn’t realized there would be such historic trees, too. 19Teen: If you could have met Jane Austen in person, what’s the one question you are dying to ask her? How do you think she would answer? 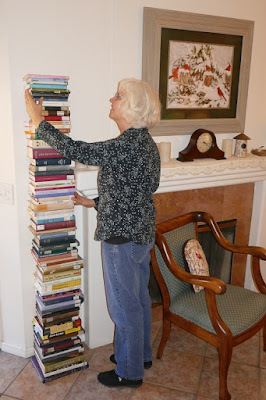 19T: Which of the many wonderful activities you include in your book is your favorite and why? Nancy: Self-publish a book. Why? Because Jane didn’t wait to grow up to see her stories in print. She self-published her poems, stories, and fragments by hand-printing then in three nice notebooks that are called her Juvenilia. Those notebooks can still be read today! I want to encourage young writers to take their writing seriously, even at this age, and self-publish their stories, too. Who knows? Two hundred years from now, someone might be reading and quoting their Juvenilia, too! -Milk or lemon in your tea? Neither. My current favorite tea is herbal mint. Plain. -Cucumber sandwich or scone to go along with it? Cucumber dill to be exact! Turban. Dark lavender turban. With color-coordinated reticule. I made both of them in classes at the 2017 Annual General Meeting of the Jane Austen Society of North America in Huntington Beach, CA. -Ostrich plume or peacock feather in your hat? Country dance. We hosted several in our home while I was writing this book. I also found the music to a couple country dances that Jane knew how to play and I played them on my piano, too. 19T: Finally, where can readers go to connect with you and learn more about your books? Nancy: My book’s official site is here. Our heroine this time wasn’t born in the nineteenth century, but her efforts and attitude have recently inspired me, and I thought they might inspire you too. Because she is still alive, I couldn’t find a picture that wasn’t proprietary, but you can find the painting that made me want to learn more about Joanna Boatman here (scroll down and click to read thoughts from the artist). Joanna’s family arrived in the United States in the late 1800s and settled around the turn of the century in Kalama, Washington. She still lives in the house in which she and her mother were born. She attended school in Kalama, graduating from Kalama High School, then went on to graduate from Emanuel Hospital School of Nursing in Portland, Oregon. Joanna is an incredibly industrious woman. She started working at age 12 at a downtown soda fountain. She was a member of the County Civil Defense Team in World War II, keeping watch for enemy plans. Shortly before she graduated nursing school, she complained about some civic work on her street, and her brother-in-law challenged her do so something about it. She ran for City Council and won. Then she ran for mayor and won, at age 28. She was the second woman in Washington history to serve as a mayor. She was re-elected, serving a total of 5 years. She also served as chair for the Cowlitz County Planning Council. As a nurse, Joanna worked at Cowltiz General Hospital in Longview, about 11 miles to the north, for 18 years. But caring for the sick all day wasn’t enough for her. She’d return home and care for those in the area who were ill, as many as 30 hours a week. She provided hospice care, dealt with prescriptions, cared for wounds, and offered a respite for those with sick children. They still talk about the Columbus Day Storm of 1962 in our area (see example of damage right). Joanna helped her neighbors afterward to such an extent that the Washington State Patrol gave her an award. She moved to Seattle and worked at Virginia Mason for more than 30 years. There she joined the Washington State Nurses Association. She would go on to serve as its president, the first staff nurse to do so. Not content to govern from Seattle, she drove all over Washington to listen to the concerns of her sister nurses. Those nurses reciprocated her respect by voting to change the bylaws so she could serve a second term as President. She also served as delegate to the American Nursing Association convention and delegate to the National Council of State Boards of Nursing. 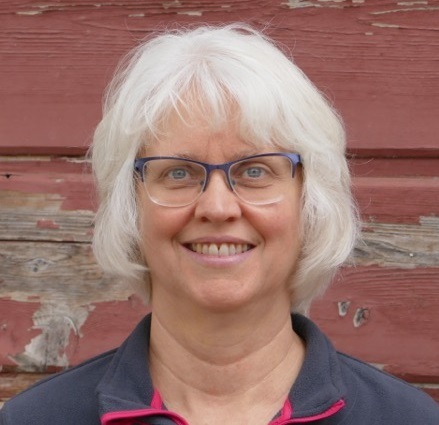 She was appointed to the Washington State Nursing Care Quality Assurance Commission and, you probably guessed it, was elected Chair of that commission, two things no staff nurse had ever done before. She also served as president of the Seattle Chapter of Operating Room Nurses. She was such an advocate for nurses that she served as picket captain when the nurses went on strike at Virginia Mason in 1976. She was inducted into the Washington State Nurses Association Hall of Fame in 2000. We should all be so fortunate as to have a woman like Joanna in the family. I’m not much of an April Fool’s Day prankster, but I did catch one April Fool joke yesterdaythat amused the heck out of me: down-filled swimwear from outdoor clothing specialist Eddie Bauer! Well done, EB—you certainly made me smile! And even more wonderful are these costumes from Petit Courrier des Dames, Journal des Modes from December 1833 with a distinctive international flair—and very short skirts!! I suppose if one is disguised as a Scottish (love the plaid ribbons lacing up her dancing slippers), Swiss (I think the braids, a la "Swiss Miss", are supposed to be the clincher), or German (okay, why this costume is supposed to be distinctively German somehow eludes me...) lady, it’s possible to get way with displaying one’s ankles and calves in such a fashion...though I'm not sure the ladies of Scotland, Switzerland, or Germany would have agreed that these were very representative. 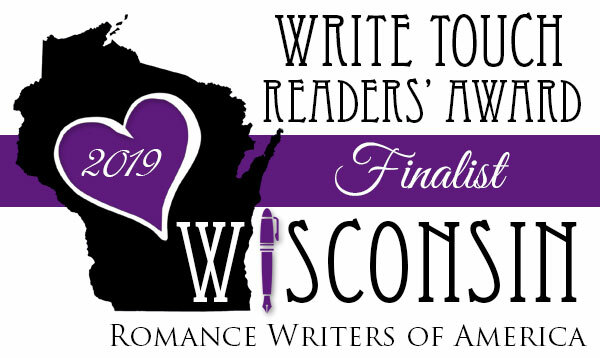 Now, here’s some nice news that isn’t at all an April Fool joke: Between Silk and Sand is a finalist in the young adult categories in both the Reader’s ChoiceAward contest of the New England Chapter of RWA and in the Write Touch Contest of Wisconsin RWA. Even if it isn't a joke, it has certainly made me smile!